Cream cheese, feta cheese, olive oil and chopped walnuts are whipped into a fluffy, savory appetizer spread to serve with crackers. 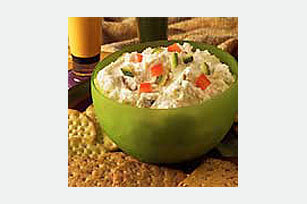 Beat cream cheese, feta cheese and oil with electric mixer on high speed until well blended. Prepare as directed, using your favorite flavor of crumbled ATHENOS Feta Cheese.